Sydney's Vivid light festival is in full swing once again, and the crowds are flocking to see the spectacular installations that have been made by great artists, and just overall smart and creative people. It's one of the best times to be in Sydney, and it's especially great if you're a keen photographer. But Vivid represents a few challenges for those of you who aren't experienced enough in photographing at night, and also in among large crowds. You need the right gear, you need to know the appropriate settings to use, you need to pick out the things you want to shoot, and you need to negotiate your way around the place to find a spot, sometimes avoiding the crowds, or sometimes using them to your advantage. If all that sounds a bit intimidating, Vivid sponsor, Canon, actually gives walking tours that are very helpful for getting to learn settings, and the way certain installations need to be shot. Furthermore, if you don't have any gear, you will be able to use an EOS 70D with an 18-135mm lens and a tripod. We went on this walking tour and can recommend it to those of you who are just starting out on your journey into photography -- especially night photography -- and want to capture some of Vivid's harbour lights. Here are our 10 tips for getting out there and capturing some interesting photos. This is important. You can't just let your camera dictate all of the settings. You need to be able to change the aperture size, shutter speed, and ISO value yourself to suite the scene you are shooting. A digital SLR or mirrorless-style camera is best. You can still use a compact camera if that's all you have, but its controls won't be as flexible as that of a more advanced camera, and you won't have physical dials to play with. A lot of the installations require a wide angled lens in order to shot successfully, especially the building installations such as the amazing display at the Museum of Contemporary Art. On the other hand, you also need a reasonable amount of zoom to get close-ups of certain installations, to capture details, or to more adequately frame distant installations such as the Opera House. If using a digital SLR, take a versatile zoom lens so that you don't need to swap lenses. Canon's walking tour gear comprises an 18-135mm zoom lens. 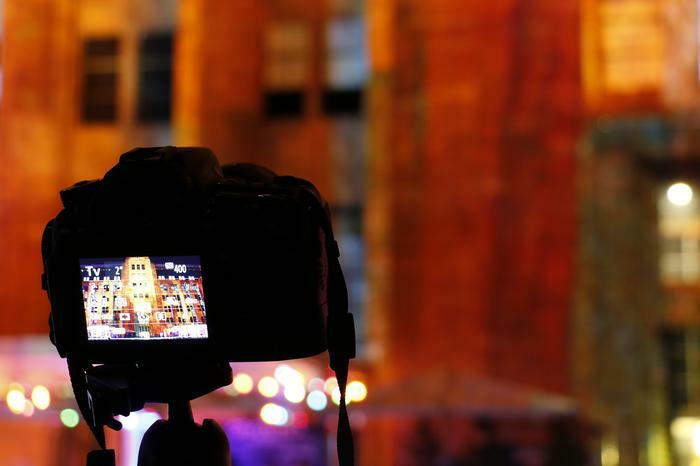 Without a tripod, you can forget about getting great, clear shots. You need to be able to place your camera in a steady spot in order to allow it to capture light from the installations crisply, and your tripod should be able to take the weight of your camera and lens easily, while allowing you to use all sorts of angles -- for instance, you might want to angle your camera upwards. Of course, you need to be mindful of the people around you while carrying your tripod in among the crowd, and it's best to fold it up when walking between installations and scoping out spots to shoot from. In addition to the tripod, you should set your camera to a shutter delay of two seconds. This needs to be done in order to eliminate shake from the act of pressing the shutter button. Even with a tripod, shake from your finger pressing the shutter can ruin a shot. 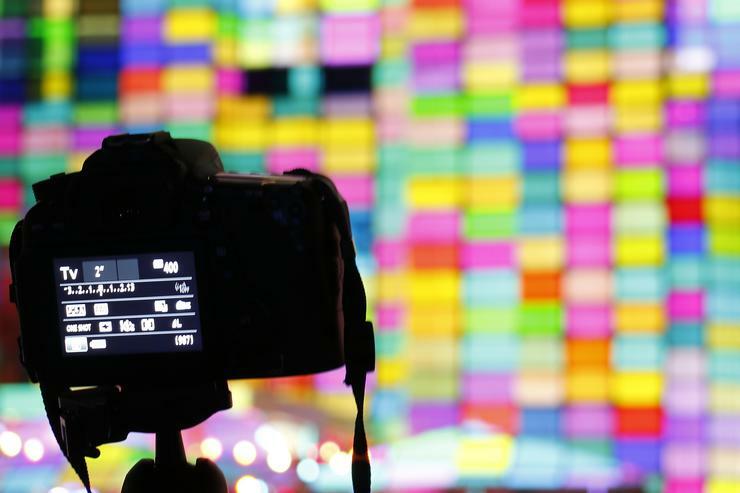 Capturing Vivid is all about letting the camera digest the lights. The way to do this is to keep the shutter open for a certain amount of time. Shutter priority is the setting on the camera that allows the shutter speed to be selected by you, while the aperture setting is decided by the camera. In general, a shutter speed of about two seconds can be used to get a shot of a bright light pattern, and a shutter of about half a second should be used if you want to capture things such as silhouettes in front of an installation. However, this is where experimentation comes in to it. Use a slower shutter speed to get blur from moving lights; use a faster shutter speed to capture light that is projecting an image. ISO is the camera's setting for its sensitivity to light. The higher the value, the more sensitive the camera will be to light, and the brighter your picture will be. The lower the setting, the darker it will be. Higher ISO values (say, above ISO 800), can cause images to look a little grainy on some cameras. For most shots, you will want to keep your ISO speed low, at 100 or 200. You should play with the ISO during shots when you want to use a quicker shutter speed in order to freeze a particular detail or capture a certain colour. In that instance, a higher ISO will allow the camera to still capture plenty of light while the shutter is quick enough to reduce blur. Sometimes, the part of the image that you want to focus on will be on the side or not exactly in the centre. During these times, you should change the focus point in your camera manually. How this is done varies depending on the type of camera, but you should know how to do it in case the need ever arises. On most cameras, the focus point is also the metering point. The camera will use the focus point to get a light reading and adjust the aperture value accordingly. When you have a grip of the settings and how to use them, you can let your creativity flow, and that is when framing comes in to it. Try to visualise the type of shot you want to take, and then attempt to frame it accordingly. If there are too many people around for you to frame your shot the way you want exactly, then consider that you might be able to crop it to look the way you want after you have taken it. For some shots, looking through the viewfinder might be too awkward. If your camera has a screen on a hinge, then use the camera's Live View function and angle the screen in such a way so that you can frame your shot without assuming an awkward stance or craning your neck. There are a lot of people around during Vivid, and this is part of what makes it such a great time to be out and about. If there are too many people at an installation that you want to photograph, be patient until you can get a relatively clear view; the lights are on until midnight, so perhaps try and get out there later in the evening, rather than in peak time when more families are about. Otherwise, use the crowd to your advantage. People standing in front of an installation can be used for silhouettes; people walking in front of an installation can provide some great motion effects. Safety is also an issue, so keep your gear within sight at all times, and try not to knock anyone out with your tripod. Sydney Vivid is on until 8 June 2015. Canon's Collective Walking Tours at Vivid are $40 per person and take in Circular Quay and The Rocks.